3rd Street Promenade Performer gets chosen on "The Voice"
Notch another high profile win for Santa Monica's 3rd Street Promenade as local singer and street performer Naia Kete was featured on NBC's "The Voice" on Monday night and was selected to audition for the blind auditions in front of Cee Lo Green, Christi na Aguilera, Adam Levine and Blake Shelton. At 21 years old, Naia makes a living performing 4-6 days a week with her brother and boyfriend. Naia's segment started out with Host Carson Daly driving to the world-renown 3rd Street Promenade, the five-block stretch of shops, restaurants and movie theaters where you can witness some amazing performances from group dancers, circus acts, magicians, puppeteers and singers where he found her performing. There he presented her with her invitation to perform at the blind auditions. And at the auditions, it was "The Lazy Song" by Bruno Mars that got both Blake Shelton and Cee Lo Green to turn their chairs. And in the end Naia chose Blake Shelton over Cee Lo to be her coach. This isn't the first time a performer on Third Street has been in the national spotlight. Just these past few months, a number has been featured either on national commercials, signed record contracts and even released albums. 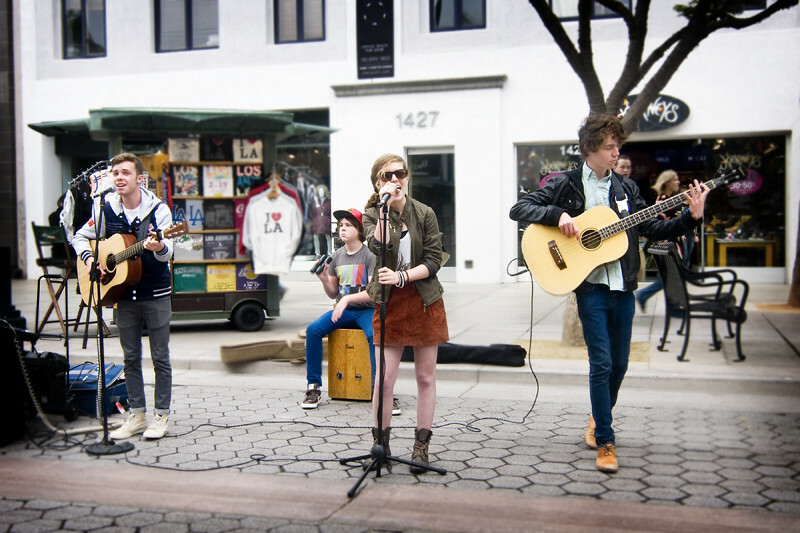 Read our article below of success stories from singers that performed on The 3rd Street Promenade. Regulars on Santa Monica's Third Street Promenade, Ready Set Go! just signed a record deal with Warner Bros. Records. It looks as though Santa Monica's 3rd Street Promenade is the place to be if you're a singer and are looking to catch that big break into showbiz. 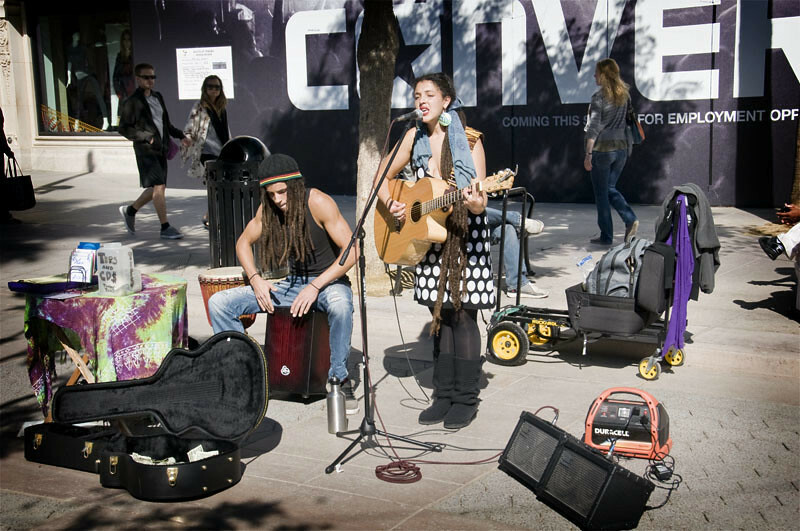 Just this past year, "buskers" or street performers singing on this famous stretch of pedestrian walk-way has been garnering some national attention with their music. Just three blocks from the beach and the pier, hundreds if not thousands of people shop on this four-block stretch of shops, restaurants, coffee houses and movie theaters. So it's most likely that a A&R rep or agent will be shopping or having a business lunch or dinner and hear the echoes of the next big thing. Who needs to try out for American Idol or X-Factor when you can sing on the Promenade? And it's not surprising to spot a celebrity shopping. I, personally, have seen the Aerosmith frontman and current 'Idol' judge Steven Tyler having dinner and former Governor Arnold Schwarzenegger riding his bike or reading at the magazine stand. I've seen Dylan McDermott, Cheryl Hines and JJ Abrams do their holiday shopping there. Not far from where The People's Court tape their stand-ups with Harvey Levin, Hey Monday recently made an appearance at Hot Topic at the end of the mall. Chelsea Williams' national Chevy Cruz commercial. 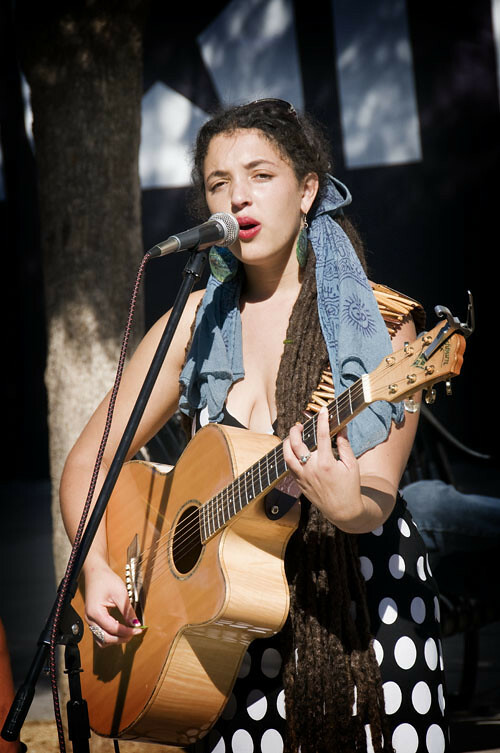 Just this past month, singer/songwriter Chelsea Williams, a regular on 3rd Street has been featured on the Chevrolet Cruz's commercial singing the Travie McCoy/Bruno Mars hit song "Billionaire." Try walking a mile in her shoes and it's hard to imagine that she performs on the street for a living. Selling over 50,000 CDs on her own, she's made fans literally one step at a time. Just head over to 3rd Street one weekend and if you happen to catch her playing, then notice the amount of times people basically stop shopping and listen. Performing a blend of covers and original songs, Chelsea's simple and catchy melodies highlights her silky, weathered voice. Darren Criss performs on Third Street Promenade. Earlier this year, Glee star Darren Criss surprised fans by performing on Third Street. To my surprise, he released his EP Human in 2010 and was singing songs off that album. And remember Q'orianka Kilcher? She was discovered singing on the Promenade and was signed not by a record label but a Hollywood agent. She starred alongside Taylor Momsen and Jim Carrey in "How The Grinch Stole Christmas" and was Pocahontas in "The New World" starring Colin Farrell and Christian Bale. Q'Orianka Kilcher performs on Third Street Promenade. Last year, another regular busker, Andy Grammer signed a recording contract with S-Curve Records (distributed by Universal Music Group) and just released his self-titled debut album, working with the likes of Matt Wallace (Maroon 5) and Dave Katz and Sam Hollander (Gym Class Heroes). His first single "Keep Your Head Up" has been watched by over 3 million people on YouTube and he recently announced he'll be heading out on his first headlining tour in 2012. Andy Grammer returns to Santa Monica to perform on the Promenade. Now, 3rd Street Promenade seems to have worked its magic again. One of my favorite bands playing on the Third Street, Ready Set Go! has just announced (via Facebook) that they just signed a record deal with Warner Bros. Records. Ready Set Go, a foursome, made up of siblings Sydney, Jamie, Noah and Graham wrap their playful, bouncy arrangements of indie-pop tunes with catchy melodies, evoking the soaring sounds of Hey Monday. But unlike the pre-packaged pre-teen bands who sound over-rocked or look over-punked, Ready Set Go aren't pretending to be something they're not. They may be young, but there is no denying their musical talents. They write their own songs that showcase Sydney's confident and seasoned vocals that sound wise beyond her years. She leads this wholesome-pop band that shines without the flashiness. The infectious "IPOD," or the ballad-y "3000 miles" and the synth-popper "Stop Messing With My Heart" are catchy stand-outs which are sure to appeal to all ages. Their father, who usually watches from a distance explains that since normal 'gigs' in venues hardly pay or pay very little, playing on Third Street allows the kids to make a little extra cash to pursue their dreams. So every so often, they'll make the drive to Santa Monica to perform a handful of sets in front of shoppers on this famous strip. Check out their YouTube channel, consisting of original songs and covers of pop hits such as Jessie J's "Price Tag" and Eminem and Rihanna's "Love The Way You Lie" which has amassed over 2 million views. Along with playing venues all over Los Angeles, Ready Set Go has already toured the country performing on major stages such as FishFest 2010 and playing high schools across the country for the Milk Rocks tour. Ready Set Go! cover Jessie J's "Price Tag"